(Nanowerk News) A collaboration between the Advanced Photon Source and Center for Nanoscale Materials at U.S. Department of Energy’s (DOE) Argonne National Laboratory has "seen" the crystallization of nanoparticles in unprecedented detail ("Capturing the Crystalline Phase of Two-Dimensional Nanocrystal Superlattices in Action"). In order to call up a specific bit of data, it is ideal to store information on a two-dimensional crystal lattice with well-defined graphical coordinates. For example, every bit of information of a song saved on a hard drive must be stored at specific locations, so it can be retrieved later. However, in most cases, defects are inherent in nanoparticle crystal lattices. 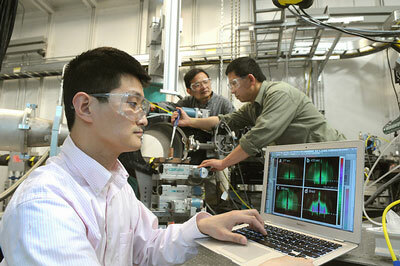 Assistant physicist Zhang Jiang (from left) examines a X-ray diffraction as physicist Jin Wang and nanoscientist Xiao-Min Lin prepare a sample at one of the Advanced Photon Source’s beamlines. The Argonne scientists have examined nanoparticle crystallization in unprecedented detail using the high powered X-rays of the APS. Controlling the degree of ordering in nanoparticle arrays has been elusive. The number of nanoparticles a chemist can make in a small volume is astonishingly large. Because nanoparticles are so small, it is not easy to see how ordered the lattice is during the self-assembly process. Electron microscopy can see individual nanoparticles, but the field of view is too small for scientists to get a “big picture” of what the ordering is like in macroscopic length scale. It also doesn’t work for wet solutions. "With local ordering, one cannot assume the same order exists throughout the whole structure; it’s like seeing a section of road and assuming it is straight and well constructed all the way to the end,” Wang said. The same group of researchers at Argonne, together with their collaborators at the University of Chicago, discovered that under the right conditions, nanoparticles can float at a liquid-air interface of a drying liquid droplet and become self-organized. Using high-resolution X-ray scattering at the Advanced Photon Source (APS), Jiang and the others examined the crystallization process in unprecedented detail as it forms in real time. They discovered that the nanoparticle arrays formed at the liquid-air interface can enter a regime of a highly crystalline phase defined in the classical two-dimensional crystal theory. Only when the solvent starts to dewet from the surface, do defects and disorder begin to appear. With this level of understanding, the scientists hope that one day devices such as the iPod Nano can be made from nanoparticles.